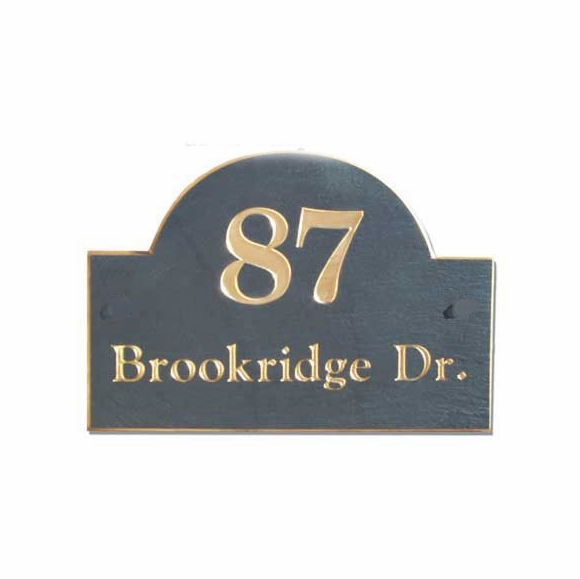 Stone Mill 11900 Slate House Plaque 8x12 Arch Shape - - personalized with your house number and street name. Crafted from slate that is newly quarried in the USA, hand cut to size, sand carved, and painted with durable enamels. Made for you in the USA. Line 1 holds up to five (5) characters (including spaces!). Line 2 holds up to fifteen (15) characters (including spaces!). Choose one of the following color combinations: GW green slate with white characters; GB green slate with black characters; BW black slate with white characters; BG black slate with gold characters. Made to order. Delivery time: please allow 3-4 weeks for delivery.